I like using Bose QC15s for noise reduction in-flight because they are excellent at reducing both engine and white noise, are comfortable, and can be found relatively inexpensively on eBay relative to newer model Bose headphones. On the other hand, the QC15s a bit bulky in their carrying case, require AAA batteries and are expensive enough to be annoying to lose. It would be nice to have some headphones that are smaller, don’t require batteries and wouldn’t be a big deal if I left them somewhere. I’ve known for a while that you can get earbuds with good isolation, but I wanted to understand how it compares to what I already have. As it turns out, not can you get better isolation than the Bose headphones, you can do it for a lot less. Blocking your ear canal intuitively seems like it would do a better job than trying to figure out the opposite waveform of the one that you want to cancel, but how much better? This gave me a good ballpark for what the QC15s could do, but I’d really wanted to look at a comparison of what the attenuation looks like across a wider spectrum than just the 125Hz in the video. The Shure in-ear headphones in the above table that are fitted with foam inserts were able to beat out the Bose headphones by 11dB at 125 Hz, 27dB at 1 kHz, and by a good margin across the board. Due to the way that the human ear perceives sound, every 10 dB in reduction is perceived as half as loud as the original. If you can get a reduction by 30 dB, then your ears will perceive about an 8X reduction in loudness, which is roughly what we’re looking at here. I considered buying some Shure headphones, but the build quality of their lower cost headphones are questionable and you should be able to get the same isolation with similar inserts on headphones that cost less than the lowest-end Shures. You fortunately don’t have to buy Shure to get foam inserts. Foam inserts are essentially fancy earplugs that you can put on your headphones. Comply, a 3M spin-off, makes them for a large variety of headphones. 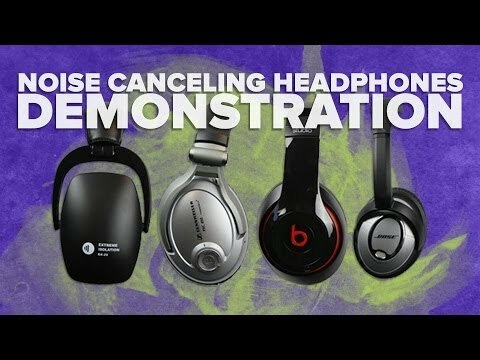 A good test of these would involve a microphone that simulates a head, similar to how headphone.com measures headphones. Unfortunately, I don’t yet have that kind of test equipment, so instead I walked alongside a busy street to compare my Bose headphones against some earbuds with Comply inserts. With the Comply inserts, cars and buses were reduced to a whoosh with no music and were firmly in the territory of being able to sneak up on me with music. A light rail car wasn’t quite that silent with no music, but again in the somewhat dangerous zone with music. I wouldn’t feel comfortable casually wearing these to work for that reason, though there is a sport version that isn’t as quiet. With the Bose headphones, the sound was greatly attenuated, but not quite enough to get me run over by a car. I could believe an 8X reduction, but I don’t have any hard numbers to back that up. If you want a pair of essentially disposable headphones compatible with Comply’s foam inserts, then you could do worse than a pair of Panasonic ErgoFit RP-HJE120. The Panasonic earbuds run about $9 and they work with the Comply Comfort 400 series tips. I’d suggest getting a mixed pack until you figure out what size fits your ear the best, but supposedly medium-sized inserts work well for many people. If $5 for a set of fancy earplugs seems a bit pricy and you don’t mind waiting a few weeks for your inserts to show up from China, you can get also get them inexpensively on Aliexpress for about a dollar a pair. For an upgrade in quality from the Panasonic earbuds, I like the MEE audio M6 Pro In-Ear Monitors. The M6 Pros sound great to me out of the box. They also come with some medium sized Comply inserts in the box, and you can replace the cables when they wear out. That gets you a feature set that’s very similar to the more expensive Shure SE215 headphones at the price point of the lower-end Shure SE112. Not only do you not have to compromise on noise reduction using smaller in-ear headphones, but you can do much better than larger active headphones. The main trade-off is that you have to put something in your ear instead of over your ear, which can be uncomfortable for a long trip. It’s fairly popular advice these days for you to sign up for a bunch of credit cards with sign up bonuses so that you can use them to travel. As long as you’re not paying a lot upfront to get that bonus, it’s effectively free money, so the value of the points aren’t that important. But what about when you’re not looking for a sign up bonus and just spending on your cards?